The sound of a group of people cracking seeds brings to my imagination a pack of squirrels let loose at a bird seed factory. Tết is the season of melon seeds. Snacking on them practically becomes a national sport during the Lunar New Year holidays. In every Vietnamese home, people put out trays full of the roasted seeds, along with candies, preserved ginger and other dried fruits, biscuits, and nuts for their guests. Most visitors to Việt Nam wonder why; the first time you try to crack one, the shell shatters into shards, and the tiny seed inside breaks into bits—just an unpleasant mouthful to spit out. But it creeps up on you. The next thing you know, you are cracking seeds with everyone else. Everyone in my husband’s family, having eaten the seeds since childhood, can crack them and extract the contents in one swift combined movement of tongue and teeth. They amass huge quantities of perfect half shells in no time at all. Beginners struggle with the shells, spitting out slivers with bits of seed still stuck inside. The shells, red on the outside and tan on the inside, are everywhere: on the road, in piles on tables in houses and cafes, and scattered on floors, where they fall when scooped off tables to make way for more. As soon as they are cleared away, more take their place. The watermelon seed frenzy continues unabated after Tết, but eventually peters out, only to start up again when people are in the mood for a treat, or any time there is a large gathering. They’re often available in tiny sacks at cafés and drinking establishments. During betrothals, weddings and wakes, the hosts put out saucers of seeds and pots of tea for the guests. The sound of cracking shells blends with the buzz of congratulations or the sombre mumble of condolences and prayers. Both the fruit and the seeds of watermelon are popular during Tết because their red colour represents luck, but the seeds are from varieties bred for high seed production, not for sweet fruit. 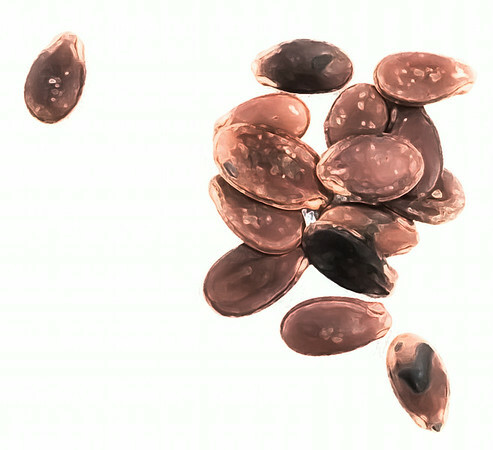 Several years later, the first reports came out that some seeds on the market were dyed with rhodamine B, a carcinogenic compound. In 2009, Chinese watermelon seeds were pulled from the Vietnamese market after news got out that the Chinese seeds were contaminated with it. Vietnamese food producers have also been found to use rhodamine B in spices, particularly chili powder and satay powder for local use, and also for export. For a couple of years, my husband’s family put out hạt bí (pumpkin seeds) and hạt điều (cashew nuts) and only a small amount of watermelon seeds. I’ve seen hạt hướng dương (sunflower seeds) at some people’s homes, and hạt dẻ cười (pistachio) which, even more than cashews, are a luxury in Việt Nam. I love the name, which means “smiling chestnuts”. Now, watermelon seeds tend to be a much duller shade of red, or even brown, and the colour is no longer uniform, with speckles and shade variation instead. I remember people who consumed watermelon seeds heavily would often complain of scratchy throats. My husband could go through a kilo a day and back then, always had a pocketful of the red seeds during the Tết holidays. He always blamed his sore throat on beer, but I noticed that I too would get a scratchy throat when I ate a lot of seeds. In 2013, another big fuss arose, and many local print and online journals and newspapers published articles about how to choose watermelon seeds that wouldn’t endanger peoples’ health. In one article (in Vietnamese) the reporter quotes a worker in the watermelon seed industry as saying “If the seeds aren’t soaked in bleaching agents and then dyed, they don’t look beautiful or shiny.” (My translation.) The reporter spent some time in a hạt dưa factory in Tây Ninh, where he watched workers soak the seeds in a chemical that he calls xút , which he explains is used in the fabric-dying and soap-making trades. When I looked it up, I found out that xút is sodium hydroxide. In other words, lye, which isn’t so bad if they use food grade lye. But then the reporter describes practices in two different factories that involved using motor oil to make the seeds shiny, because apparently, food-grade oils won’t do. I guess they aren’t viscous enough. Sadly, in Việt Nam, these scary stories, sometimes rumours and sometimes true, come out all the time. Often, Chinese producers are blamed, partly because of the non-stop barage of food scandals coming out of China, and partly because Việt Nam imports a lot of food products from its neighbour, but locally produced foodstuffs are just as likely to be contaminated. Everyone is tempted by the whitest, bounciest rice noodles, the shiniest, reddest watermelon seeds, and so on, until yet another fuss arises and then everyone stops buying the evil product of the month altogether. Sometimes the problem is agrochemical residues on produce, and sometimes it’s whiteners, colouring agents and preservative chemicals added to products before they’re sold at the market. My husband’s relatives make and sell bún noodles, but in 2013, they couldn’t sell for any price. Huế’s famous noodle soup and favourite breakfast dish, bún bò Huế, was no longer on the menu anywhere, because several kinds of noodles all over Việt Nam had tested positive for tinopal, an optic whitener. The relatives never added tinopal to their noodles, as theirs is a tiny village industry, but their business, and that of the entire village, suffered for over a year. Noodle sellers and anyone making or selling bún bò Huế had to find other work. Even now, sales are still not what they used to be. A decade ago, many of my friends, both in Canada and in Việt Nam, were refusing to buy Chinese products. At the time, I didn’t take it so seriously. That has changed. But I still buy Vietnamese food products. Sometimes I wonder how smart that is. Sometimes I just want to ignore all the food scandals and enjoy my food. Việt Nam cuisine has so much to offer. People in other countries have worried about imported shrimp, basa fish, chili powder and other Vietnamese products that have tested positive for various contaminants and subsequently been pulled from markets, but the problem is much bigger. It’s worldwide. Sometimes the problems are caused by carelessness or laziness. People not bothering to wash their hands, or people lying and not bothering to report test results, like the brothers responsible for the E. coli outbreak caused by contaminated water in Walkerton, Ontario, Canada. Sometimes the cause is people simply not aware of the dangers, or people thinking that by not eating what they’re growing or selling, they’ll be safe. I cannot understand why the people who use illegal and toxic additives to “improve” the look, texture or shelf life of foods don’t ever stop to think that these contaminants might be in their own food. That big melamine milk fuss in China that seriously sickened 300,000 babies a few years ago . . . did the big bosses of those factories think they would just never drink milk and therefore never be affected? Didn’t it occur to them that maybe their own children might drink the melamine milk at someone else’s house? At school? Or that if they eat at restaurants, they themselves might be served products containing the toxic things they make in their factories? I understand that in many countries, including Việt Nam, profits can be slim and people are trying to do what they can to make their products most attractive to customers, but this is not a good excuse for endangering public health. And there’s no excuse at all for the people who are supplying chemicals with promises of better looking, longer lasting foods if only you use “this magic powder”, which is often sold in unmarked bags in Vietnamese markets. Worst of all, it’s not the poor farmers and itinerant sellers who make the most profit from the use of illegal additives and pesticides, but they are often the ones who get poisoned first, from primary contact while handling the products without sufficient safety equipment or clothing. This blog post has wandered somewhat from the topic of watermelon seeds. I’m glad to say that people no longer desire the shiniest, brightest, reddest seeds, and they are once again easily obtained on the market. But I wonder sometimes about the future health of my husband, who breathes in hạt dưa at Tết as if the seeds were air. At least, unlike people who haven’t grown up with the seeds, he cracks them between his teeth without even getting the shells wet. I probably absorbed as much rhodamine B during my early attempts to perfect my watermelon-seed-cracking technique as he has in his entire life. One thing I can be glad for is that watermelon seeds in Huế always had a matte appearance; the fashion for seeds with a high gloss, achieved by coating them with motor oil (with the belief that it was safe because it stays on the outer shell) never seemed to catch on the way it did in Saigon. This entry was posted in A to Z, Cooking, Food, Viet Nam and tagged food contamination, food safety, hạt dưa, Tết, watermelon seeds. Bookmark the permalink. These posts are going to be a book one day right? Really so interesting. I like the wandering. Reminds me how much food is always about something else also, so many issues. Yes, food is about everything, and everything is about food, isn’t it. You never know…some of these just might make it into a book. Will need some editing though. Too blog-posty the way they are. Thanks, Margrét. What? You’ve been in VN…how many years?…and this is your first encounter with watermelon seeds? You can always stick to seedless melons, but you need the seeded ones to get more seedless ones. Nice transparency. Was wondering how I might get a more interesting melon seed photo. You caught some nice texture with this one. I’ve come to the conclusion that I hang with a very different group of Vietnamese and go to very different places than most people here. Interesting. I have never eaten one. I know a friend who will be working in Veit Nam in about a year or two. I will copy and print this informative article for them. I think it’s softer until it gets roasted. Then it becomes quite brittle. But if you position between your teeth just right, you can crack it right down the middle on the line dividing the shell into two halves. If your friend is interested in Vietnamese food, tell them this is one of a series of A to Z posts on Viet foods and ingredients. I for In a Viet Kitchen is next…probably tomorrow. Any time I’ve had watermelon I’ve always scooped out the seeds and composted them. The chemicals used in food production, not only those used illegally but also those permitted, are a source of speculation and concern. The insecticide DDT was banned years ago, but presumable was replaced by something equally dangerous. Recently, in a television report on food, an ‘expert’ said as a rule of thumb that we shouldn’t eat anything with a label — and he was only referring to processed foods with a sugar content. But increasingly it seems that even fresh food, i.e. stuff without a label, can be equally bad for your health. Ideally, we’d only eat things we grew ourselves, but even then, you don’t know what’s in the soil. I know someone who heavily sprayed all kinds of pesticides and herbicides for years…wouldn’t want to be the next owner of that property. Thanks for taking time to read this post so closely. That link provides some very scary information.